Stunning floral and foliated designs in varied shapes and sizes, for use in sidelights, fanlights, transoms, and in other art and craft projects. 163 lovely, royalty-free patterns. 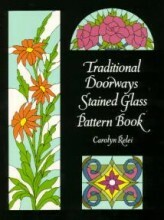 Click the button below to add the TRADITIONAL DOORWAYS SG PATTERN BOOK to your wish list.